Etty Hillesum’s furrowed brow and quizzical expression gaze at me from the book cover from across the ages as if to say, “I did it. Can you?” She challenges me to, once again, recommit to finding wholeness within, no matter what. Except for the cigarette in her right hand, she vaguely resembles me, but it’s her inner life, revealed in her diaries and correspondence, that makes me feel as if I’ve found both a soul mate and a role model. 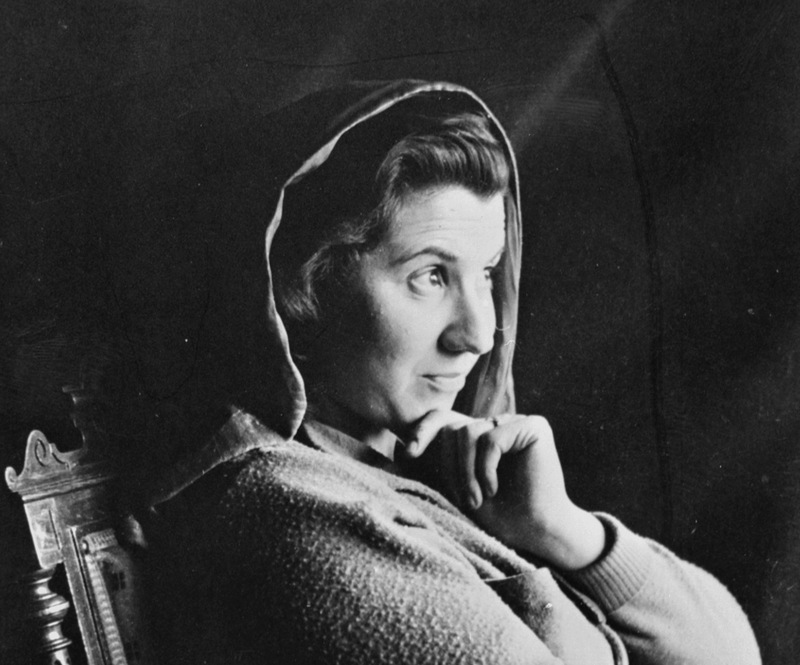 Born in 1914, Ms. Hillesum, a secular Jewish citizen of the Netherlands, had been a free spirit and seeker who managed to find self-acceptance and meaning in life, even as the Nazi persecution of Jews intensified, even in the Westerbork transit camp where she tried to ease the suffering of its occupants, even knowing death soon awaited her, too. When boarding the transport to Auschwitz, she was “talking gaily, smiling, a kind word for everyone she met on the way, full of sparkling humor,” according to a witness. She perished there a few months later. Come on, my girl, get down to work or God help you. And no more excuses either, no little headache here or a bit of nausea there, or I’m not feeling very well. That is absolutely out of the question. You’ve just got to work, and that’s that. No fantasies, no grandiose ideas, and no earth shattering insights. Choosing a subject and finding the right words are much more important (p.8). I hadn’t opened the book in a long time, but the rise of Fascism in this country brought Etty Hillesum to mind. As described by memoirist Eva Hoffman in The Forward, “But capable though she was of extroversion and engagement, her most intense need, and gift, was for the inner life. Her essential existence, she often reminded herself, took place in the privacy of self-reflection, at a desk covered with pinecones, vases of flowers, and books.” Since I, too, share this strong need for the inner life, yet feel pulled away from it by current events, I flipped through the pages as if I were consulting the I Ching to cull advice for these tumultuous times. In her words, “To live fully, outwardly and inwardly, not to ignore external reality for the sake of the inner life, or the reverse – that’s quite a task.” Indeed, even for those who are privileged with objective safety, it can be challenging to decide where to place one’s attention when the world no longer seems recognizable. How exotic the jasmine looks, so delicate and dazzling against the mud-brown walls. Our deaths are certain, too, even if not imminent. Living fully, whether for several more decades or just a few more days, requires pausing and appreciating. Even in horrifying circumstances, or perhaps especially when they are dire, pausing is a necessity rather than a luxury. It’s been several days since I’ve truly slowed down to observe nature closely, a practice I’ve spent the last year cultivating. In letting this habit slide while staying abreast of the news and immersing myself in books, I started to lose my connection with myself. As Etty reminds me, that connection is really all we ever have, no matter how much and how hard the world is trying to pull us away, and is worth keeping no matter what. That she lived so fully when others succumbed to shock and despair is not something she could share publicly, lest it be misunderstood or mocked. Very well then, this new certainty, that what they are after is our total destruction, I accept it. I know it now, and I shall not burden others with my fears. I shall not be bitter if others fail to grasp what is happening to us Jews. I work and continue to live with the same conviction, and I find life meaningful – yes, meaningful – although I hardly dare say so in company these days. During this polarizing and uncertain period, her words encourage me to invest my energy in finding and claiming my own meaning and not squander it by judging those whose responses might differ or whose experience of the world hangs together in a way that I can’t comprehend. That Ms. Hillesum was able to turn horrifying circumstances, designed to crush her humanity, into a crucible for her spiritual growth, once again leaves me breathless and, dare I say, hopeful. Hers is a path open to any of us, assuming we wish to attempt it.